i Polished brass - hand polished and left unlacquered allowing the brass to age naturally and gain a characterful patina over time. If you wish for the aged brass look then this is the finish you should choose. The parts will arrive shiny but will soon patina in the bathroom environment. If you wish to keep the polished finish follow our product care instructions. 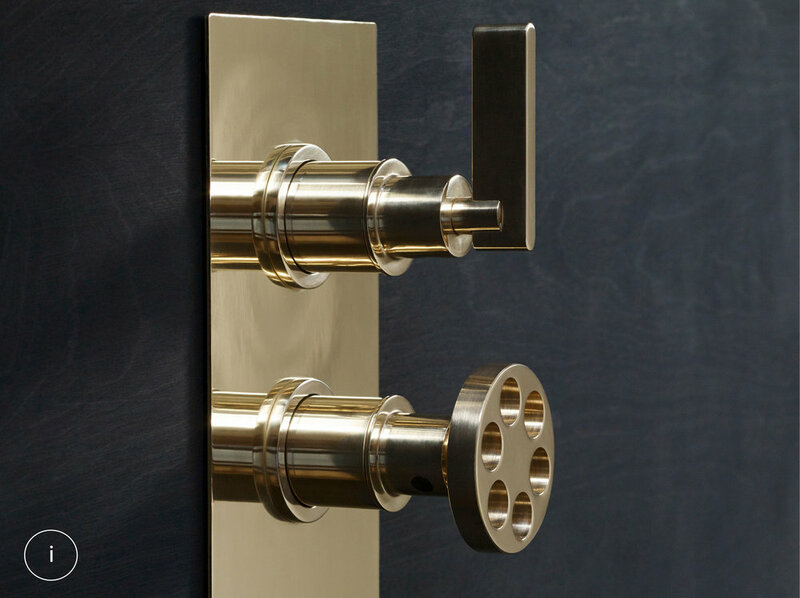 ii Brushed brass - hand finished with an abrasive wheel to achieve a brushed metal finish. The effect is more industrial than a typical satin tap finish so expect small variations in finish between parts due to finishing by hand. Fittings are left unlaquered allowing the brass to age naturally and gain a characterful patina over time. iii Weathered bronze - chemically treated by hand to produce a brown mottled finish. Expect changes in tones between parts due to the processing by hand. Only available matt lacquered to preserve the finish. iv Matt black - a stove enamelled finish. v Off -white - a stove enamelled industrial finish.